Wire Rope Thimble For Cable Diameter 5/16 in. Thimble For Cable Diameter: 5/16"
Wire Rope Thimble For Cable Diameter 1 in. Thimble For Cable Diameter: 1"
Wire Rope Thimble For Cable Diameter 3/8 in. Thimble For Cable Diameter: 3/8"
Wire Rope Thimble For Cable Diameter 3/4 in. Thimble For Cable Diameter: 3/4"
Wire Rope Thimble For Cable Diameter 5/8 in. Thimble for cable diameter 5/8"
Wire Rope Thimble For Cable Diameter 1/2 in. Thimble for cable diameter 1/2"
Wire Rope Thimble For Cable Diameter 5/32 in. 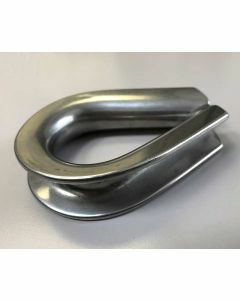 Thimble For Cable Diameter: 5/32"
Wire Rope Thimble For Cable Diameter 1/4 in. Wire Rope Thimble For Cable Diameter: 1/4"
Wire Rope Thimble For Cable Diameter 3/16 in. Thimble for Cable Diameter: 3/16"
Wire Rope Thimble for Cable Diameter: 3/32 in. or 7/64 in. - 1/8 in. 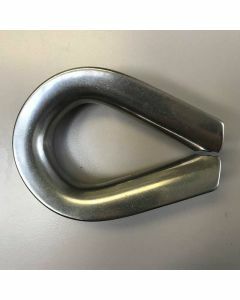 Thimble for Cable Diameter: 3/32" or 7/64" - 1/8"